popcash.net is pop under ad network.Popcash, give instant payout and real-time tracking. I write popcash review 2017 after earning 300 $ .i use Popcash from one year.it gives good CPM rate up to 2.5$. I also earned 1000$ per month from exoclick . What is pop-under ads? it is a not banner ads or nor a text ad. These type ads are not visible but when a visitor visits on our blog and clicks anywhere it open in the back ground or new tab. Sometimes these ads are not good for our blog performance because our visitor hates popads . About all publisher using Adsense but if you get banned from AdSense it is the best alternative. many publishers ask can I use popcash with Adsense. My answer is yes you can use both ads on the same blog but not on the same page means pop-under ads and Adsense cannot use on the same page. Read adsense guidelines how to place ads. Popcash is big ad network in pop-under. It gives pop-under ads.These are open in once within 24 hours it is good for the visitor that no pop-under open again.it gives instant payout.Many ad network open ads every time when a visitor come on our blog but it open one time in a day so our visitors are safe. website approval is very easy it approves all websites and blogs with a subdomain (eg. , Blogspot, WordPress etc) No minimum traffic required for approval website. it also allows adult traffic blog or website. The best thing about this ad network is the very low minimum payout. Many networks have high payout net 30 or 45 but it gives instant when we request. The small publisher can reach easily their minimum payout. minimum payout is 10 $. If you want to promote you get 10% earning of publisher and advertiser lifetime who join by your referral link. I earn a lot of money by referring it sure you can do it. Accepted low traffic blogs with a subdomain. I tell about popcash review all possible things. If you get banned from AdSense or not approved join this network and earn money. In this post all points by my experience. Affiliate and Adsense, not a way to earn money from a blog. Drive traffic and join popcacsh. It helps in earn money from the blog. network. Sisterads doesn’t ask any minimum traffic so it’s also good for newbies. @MATABATA I check this network and as soon as i write review on it. 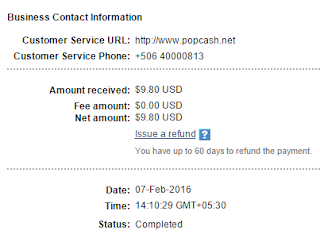 Thanks for the great popcash review, They are pay me always on time and support is also good. Hi Pramod, First time in your blog and have to say that you are updating with various money making ways regularly. Although I have not tried many of them, but it seems really good to see there are so many ways and you are actually sharing them honestly and at the same time helping others. Keep up the good work bro. Great article. Thank you for sharing that type of content. I am struggling with my website revenue. Now, i hope popads are useful for me.